Nuclear fusion is the process of squeezing two atoms together so tightly that their nuclei fuse, creating a heavier atom and releasing a blast of energy. Fusion creates the inferno inside the sun — and the hydrogen bomb — but no one has yet harnessed its enormous power for peaceful uses. They’ve tried, however, often with skepticism. In 1989, physicists Martin Fleischmann and Stanley Pons announced they’d achieved “cold fusion” of hydrogen into helium at room temperature, only to face withering scorn when others failed to replicate their results. 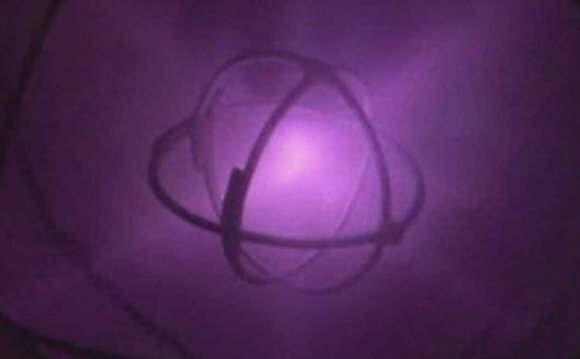 Luckily, DIY nuclear engineers can achieve honest-to-goodness “hot fusion” right at home by making a Farnsworth-Hirsch fusion reactor, or fusor for short. This mini fusor is a demonstration version — while it generates only insignificant quantities of fusion products, it does show how inertial electrostatic confinement (IEC) reactors use kinetic energy to cause fusion. It’s also a good introduction to high-voltage power supplies and vacuum systems. The skills the project imparts will help you tackle bigger fusors and other projects involving plasma and high-energy physics. This project uses high voltages at potentially lethal currents. A high-vacuum apparatus may implode if improperly handled. This device may produce ultraviolet and x-ray radiation. Do not attempt to build or operate it unless you are capable of safely using high voltage and vacuum equipment. The typical Farnsworth-Hirsch fusor has two concentric electrical grids inside a vacuum chamber: an inner grid charged to a high negative potential, and an outer grid held at ground potential. Our benchtop version has a stainless steel wire inner grid, and uses the aluminum chamber walls as the outer grid.